The Best U.S. Speeding Ticket Tips for Canadian Snowbirds! Attention Snowbirds: Don’t ignore those U.S. speeding tickets! If you’re a Canadian snowbird who drives south for the winter, it’s likely that you’ll receive a U.S. traffic ticket at some point in time – whether it’s for speeding, a parking violation or something else. Some of our members have encountered this very issue, and have contacted us to get a better understanding of the consequences of receiving a traffic ticket in the U.S. and how to deal with it. Accordingly, we have created this guide to help you understand and deal with U.S. speeding tickets and other traffic violations. Many U.S. states and Canadian provinces have reciprocal agreements to share information about speeding tickets and unpaid traffic tickets of any sort. Even if there is no reciprocal arrangement in place, if you let your ticket - yes, even a parking ticket - go unpaid, you will be in trouble if you ever get pulled over in that state again for any reason. If you’re thinking nobody will find out, think again! In the digital age, they know everything about you! Demerit Points: If your information is shared with your home province, you may get demerit points added to your driver’s license in Canada. Insurance Premium Increases: Your Canadian auto insurance company may be able to access your U.S. traffic ticket information, so a traffic violation in the U.S. may increase your car insurance premiums in Canada. Denied Entry into the U.S.: If you have been convicted of a traffic violation in your absence and have not paid your fine in any U.S. state, it could hurt your chances of being allowed entry in the United States and could affect your NEXUS standing too! 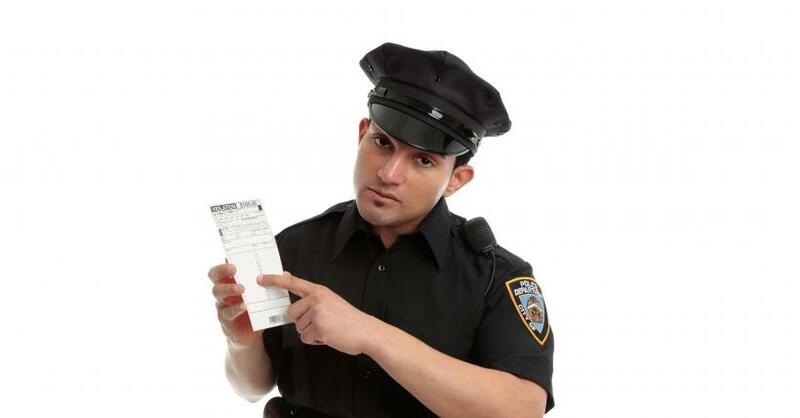 License Suspension: If you ever get pulled over for any reason in that state again and you have unpaid traffic tickets, you could find out that your license has been suspended in that state, resulting in bigger legal issues and costs. Higher Fines and Legal Issues / Costs: If you ignore paying a ticket, you may be subject to bigger fines and other legal issues and costs. Negative Credit Rating: Unpaid tickets are often handed over to collection agencies and can negatively affect your credit rating. How Canadians can avoid getting a traffic ticket in the U.S.
It’s a good idea to make sure you know all the rules of the road in all the states you are driving through. Not just the speed limits – which are aggressively enforced on many Interstate highways – but also things like turning right on a red light and other regulations. Snowbirds also have to think ahead to make sure your Canadian driver’s license and license plates don’t expire while you are away for the winter, as you can get a ticket in the U.S. for driving with an expired Canadian driver’s license or license plate. Being aware of and following all the rules can help you avoid being pulled over in the first place. If you get a speeding ticket in the U.S. you will either be asked to pay it on the spot by going with the police officer to the courthouse or police station OR you will be given a court date in the future. 1. Pay the ticket, which is usually your best bet. 2. Hire a U.S. attorney who specializes in traffic violations in the city or state where you received the ticket, which can be costly. 3. Return to the state for your court date to argue the ticket yourself in person. Whatever you do, don’t just ignore it! Protect yourself from bigger costs and legal issues later on by attending all court dates (either in person or via a U.S. attorney) and paying all of your U.S. traffic tickets.